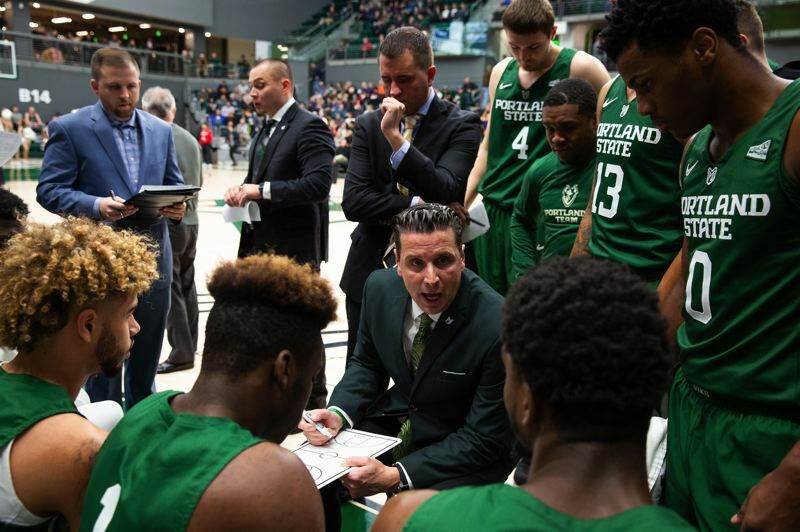 With nearly a month left before conference action begins, there is little doubt Portland State is ahead of the University of Portland on the hardcourt. The Vikings put on a display of might that covered up any potential problem areas in an 87-78 victory over the Pilots on Wednesday night in the annual intracity men's basketball skirmish. The Vikings are more brash than big, but they pounded the glass with a vengeance Wednesday at brand-spanking-new Viking Pavilion. Portland State won the rebound battle by a whopping 55-29 count, including 27 offensive boards. Peery's Vikings entered the game leading the nation with 19.7 O-boards per game and cranked their average up a notch. Through his previous career as a head coach — at College of Southern Idaho and Indian Hills Community College in Ottumwa, Iowa — Peery's team led the nation's JC ranks in scoring in four of the six years. But beyond that and a pressure defense that extends 94 feet for 40 minutes, the identity of Peery's teams might be with attacking the offensive glass. "That's something we work on every single day at practice," said Peery, 47, in his second year as head coach in the Park Blocks. "We emphasized it a ton last year. "We're going to try to go get that ball every single time. We're going to try to jam if we don't get it. We'll give points up at the other end at times, but the positives are going to outweigh the negatives. That's our style. That's how we play." Portland State is an at-best average-sized Big Sky team, with slender 6-10 sophomore center Brendan Rumel and 6-7 forwards Jamie Orme and Robert McCoy on the starting front line. The Vikings crash the offensive glass in waves, though. Orme grabbed seven caroms and four teammates snared at least three against the outworked Pilots. "They have long, bouncy athletes, and we didn't do a good job of boxing out," said Porter, in his third season at the UP helm. "A lot of times, their guys were above our guys. We didn't do a good job of putting bodies on them. "It's been a problem for us. It was a problem last year when we used our small lineup. When we used our big lineup, it's not as much of a problem. Against teams that were long and athletic last year, we had some games where we did not do a good job. Tonight, though, if we'd done a better job on free throws and made some 3's, we'd have been able to overcome that." True enough. Portland (5-5) entered the game with respectable shooting percentages from the field (.447), 3-point range (.356) and free-throw line (.726). The Pilots shot .475 from the field Wednesday night but were off the mark from the 3-point line (.292) and the foul line (.577), making only 7 of 16 free-throw attempts in the first half. Portland State, meanwhile, came in shooting .430 from the field, .251 from beyond the arc and .626 from the line. The Viks shot only .405 against the Pilots but made 10 of 23 3-point attempts (.435) and shot .739 at the line. Sophomore point guard Holland "Boo Boo" Woods — the best player on the floor Wednesday with 27 points and six assists — is averaging nearly 34 minutes per game. The next nine Vikings average 13 to 23 minutes. That's the way Peery likes to do it through a season, with his up-tempo style on offense and full-court pressure style on defense. "I always play 'Boo' too much — he's pretty valuable to what we do — but I want to play 10 or 11 guys," Peery said. "My first time I was a head coach, I said, 'We can either have seven or eight upset guys, or three or four upset guys.' I started playing that way, and I just never turned back." Peery's first PSU team won 20 games and served notice to the college basketball world at the PK80 Invitational, leading top-ranked Duke at halftime before falling and beating Stanford 87-78. The Cardinal got revenge this season with a 79-67 win on The Farm, "but we outrebounded them by 16 and took 30 more shots (82 to 52)," Peery said. "We just didn't make them (shooting .317 from the field)." The Vikings will have senior guard Michael Mayhew, a part-time starter a year ago who has been ineligible academically so far, available for the first time next week. "We'll be at full strength for the first time," said Peery, whose first PSU team was 9-9 and tied for sixth in the 12-team Big Sky race. "We can play with anybody. I like our depth, and we'll be prepared after the preseason to go into Big Sky play. "Every team has a special player or two in this league. Anybody can beat anybody. But I like how we play, I love our new home, where we can bring people in and have the feel of a homecourt." This was my first look at a game played in the $51-million Viking Pavilion, with a crowd of 2,020 filling about two-thirds of the seats (capacity 3,094). After playing their home games at Lewis & Clark last season, the Vikings are in heaven in their new arena, a bit snug but light years ahead of the old Stott Center. The seating, painted in Viking green, is almost all between the baselines, high-angled so even the seats at the top have a good view of the action. There was too much congestion around the beer stands at halftime, and photos or murals of former PSU players should decorate the walls of the concourse. Those are bugs that can be worked out in due time. The Pilots have some bugs they need to fix, too, though some of it has to do with inexperience. There are no seniors on the squad and only two juniors — Josh McSwiggan and Franklin Porter, the latter the coach's son — getting minutes. UP has five scholarship sophomores and a half-dozen freshman, including promising 6-10 center Theo Akwuba, who had nine points, five rebounds and three blocks in 28 minutes against the Vikings. "We've added some size," Terry Porter said. "We've added some skill guys, but they're young. The core group is pretty good. We just have to continue to teach and understand there are going to be growing pains with them. "We have to get tougher, but I like the group. I like the guys we have. We just have to continue to add pieces that fill holes." The two high school players who signed to letters-of-intent with UP last month could help immediately. Danyae McCaskill, a 6-3 guard from St. Louis, averaged 18 points, seven rebounds and six assists as a junior. Cody Collingsworth, a 7-1, 225-pound center from Pilot Point, Texas, averaged 18.3 points, 14 rebounds and eight blocked shots as a junior. Portland and Portland State are always fighting for relevance on the city's sports landscape, normally with little success. That only 2,000 turned out for their annual men's hoops battle Wednesday night in the teams' first duel at Viking Pavilion shows there is still a long way to go. For now, the Vikings are the ones closer to getting there.